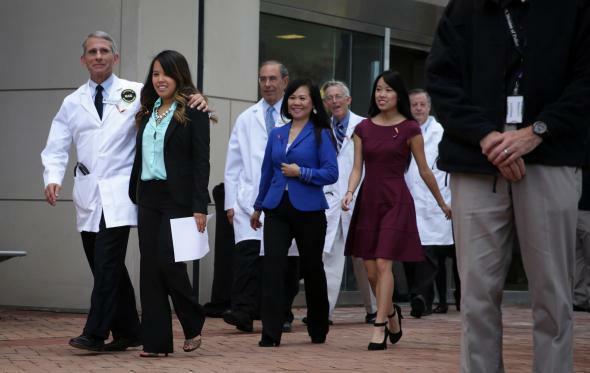 Dallas nurse Nina Pham is Ebola-free NIH says. Director of the National Institute of Allergy and Infectious Diseases (L) comes out of the building with Nina Pham (2nd L). Health officials confirmed on Friday that Dallas nurse Nina Pham is Ebola-free. Pham became the first to contract the virus in the U.S. when she tested positive earlier this month after treating Ebola patient Thomas Eric Duncan at Texas Health Presbyterian Hospital in Dallas. The 26-year-old nurse has been receiving treatment at the National Institutes of Health since Oct. 16. After weeks in isolation battling the virus, ABC News reports, Pham walked out of the NIH Friday morning to a round of applause. “I feel fortunate and blessed to be standing here today,” she told reporters. Pham is scheduled to be discharged from the hospital on Friday. Amber Vinson, the other nurse to contract Ebola at the Dallas hospital, is also now virus-free, according to her family, but will remain at Emory University Hospital for several more days of treatment, according to NBC News.